Pacific X-treme Combat, Asia Pacific’s biggest and best mixed martial arts organization, holds the PXC-35 on February 16, 2013 inside the Ynares Sports Arena in Pasig City. PXC has already established a name throughout Asia Pacific and its arrival in the Philippines last June 2011 cemented their reign as the premiere MMA organization by attracting the best fighters from the all over the world. With its most recent installment, PXC again makes its way to the Philippines to put a show in front of thousands of MMA fanatics. 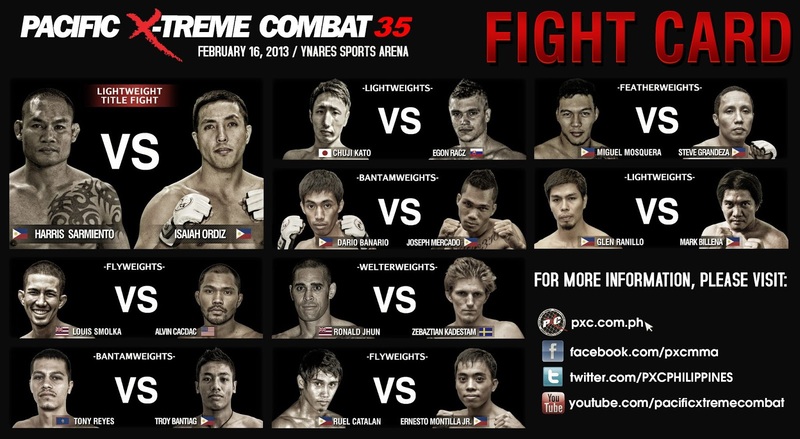 “We are very excited to kick off the year with great matchups at PXC-35 in the Philippines. The card features fighters from all over the world along with rising MMA talent from the Philippines,” says EJ Calvo, PXC CEO. 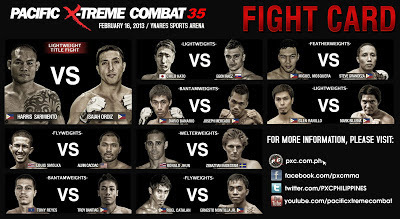 PXC-35 scheduled 9 action-packed fights to be headlined by a Lightweight title fight between Filipino talents Harris “The Hitman” Sarmiento (35-24) and Isaiah Ordiz (2-0). 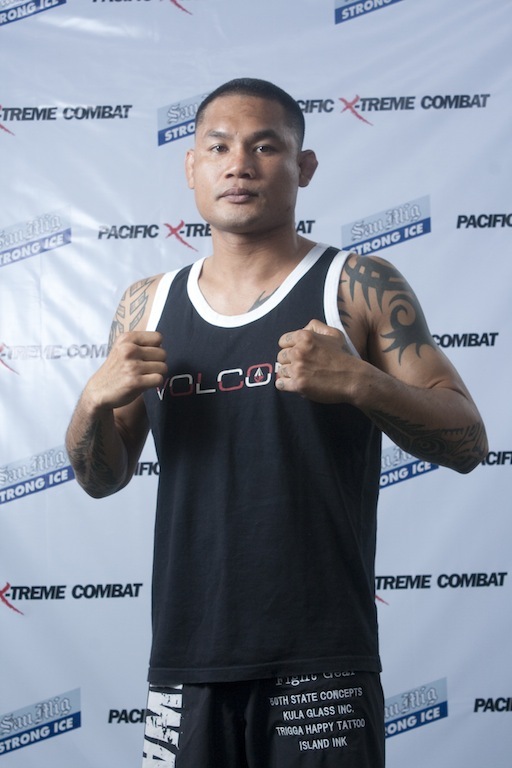 Coming off a disappointing loss to fellow Filipino-American Mark “Mugen” Striegl in PXC-34 last November, the veteran Sarmiento is set to bounce back and defend his belt against the young blood, Ordiz. This is surely a battle between a veteran and future star of the sport. In addition, the match between American Alvin Cacdac (11-9) and undefeated Hawaiian Louis “Da Last Samurai” Smolka also draws attention primarily because the winner will most likely be the next contender for the Flyweight title currently held by Filipino fighter Ale “The Young Gun” Cali. PXC-35 expects nothing but fireworks all night as fighters punch, kick and sprawl their way all for the glory of being crowned PXC victors.